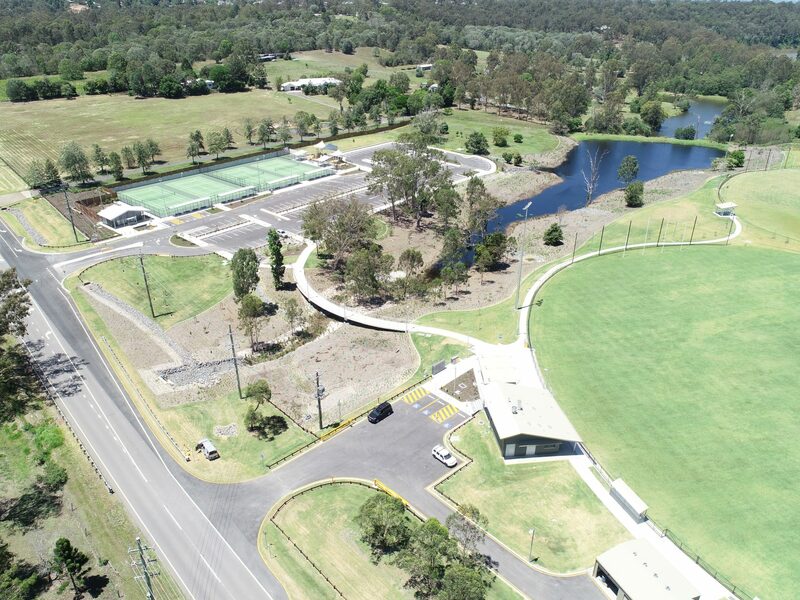 Offering local residents and visitors an array of sporting facilities and open park space to enjoy, the Moggill District Sports Complex is jointly funded by the Queensland Government and BCC to increase participation in sport and recreation activities. Located within the Moggill Creek catchment, approximately 20 kilometres from central Brisbane, the works were undertaken within a sensitive natural environment. Demolition, site clearing and stripping. Bulk earthworks – (cut to fill, large quantity cut to export & salavage for reuse on-site as topsoil). Reticulation of new services including connection to water, sewer, power, communications & stormwater. Construction of 178 space carpark, road widening and access. Construction of elite grade multi-use sports fields and courts, including D&C lighting. Netball amenities building, AFL clubhouse, canteen, office and storage building. 5,000m2 of pathways and feature seating. Revegetation, advanced trees, gardens, fencing, furniture & artwork. Project delivery in environmentally sensitive area during wet season. Design, implement & manage long-term, high efficiency sediment basins. Tight construction program to meet stakeholders’ delivery objectives. Design coordination with external entities – DTMR, QUU, Building Certifier.